We sincerely hope that these 10 Remarkable Rare Cetaceans catch your eye. These represent only a fraction of the countless cetaceans that fill the waters of our world, of course. But these stand out from the rest for various reasons, including having a rather distinctive appearance and being rare in number. We hope that you enjoy the article, learn a little more about these amazing creatures, and come away with a new or renewed commitment to protecting them and others like them. Leading off our list of 10 Remarkable Rare Cetaceans is the surprising Dwarf Sperm Whale, with the scientific name of Kogia sima. Most notably, this incredible whale currently ranks as the smallest of all known cetaceans considered whales. When spotted, however, observers often mistake this creature for a visually similar, and only slightly larger related species. In addition, the mammal remains quite reclusive, only rarely being seen. Thus, experts have no exact data pertaining to its numbers. For this reason, the IUCN currently lists the conservation status of this remarkable animal as Data Deficient, pending further research. Fortunately, however, like all marine mammals, it has some protection due to the enactment of the Marine Mammal Protection Act. Firstly, it bears noting that the marvelous Dwarf Sperm Whale actually remains smaller in size than many species of dolphins and porpoises. Also, this species displays no noticeable sexual dimorphism. Mature adults of both genders range in length from 6.6 – 9.0 ft (2 – 2.7 m). A typical weight among the majority of adults studied actually varies rather significantly, ranging from 300 – 600 lb (136 – 272 kg). In coloring, it most commonly presents a rather dark gray or blue-gray upper side, with the underside being a much lighter gray in color. Yet its most unique physical trait remains the presence of a fluid-filled sac, containing a thick, reddish-brown liquid it releases when stressed. The exact distribution of the remarkable Dwarf Sperm Whale remains rather difficult to pin down, given its highly reclusive nature. Yet, the occasional sightings that do occur indicate that the impressive mammal inhabits the majority of tropical and temperate oceans. Further, the animal, which avoids people and boats, most commonly appears to inhabit the relatively shallow areas near continental shelves. Its preferred depth remains undetermined, however, as the depths at which it has been seen vary significantly from region to region. Also, as an open ocean predator, the majority of its prey consists of small squid, various species of fish, and even the occasional crustacean. Its own principal predators include, most notably, the Orca and also the Great White Shark, though others cannot be ruled out. Next on our list of 10 Remarkable Rare Cetaceans comes the incredible, and distinctly marked, Hourglass Dolphin. Firstly, the remarkable animal is an extremely rare species. In fact, only 6 complete specimens, living or dead, have ever been studied. As a result of this rather astonishing fact, scientists have very little reliable physical data about this particular species of cetacean. Reasonable, though by no means certain, deductions about its behavior and ecology come from the widely scattered and limited observations in the wild. Also, since its population remains unknown, the IUCN lists it as a Species of Least Concern, pending further data. Finally, due to the uncertainty about its numbers, all hunting of this animal is thankfully prohibited by international law. Most notably, the Hourglass Dolphin represents a relatively small species of cetacean. The average length of the very few individuals studied, who appeared to be adults, was roughly 6 ft (1.8 m). Also, in color, these beautiful creatures principally appear black, with large white or gray stripes on the sides and stomachs. The pattern creates the impression of an hourglass, thus the common name. Furthermore, the average weight of this remarkable dolphin equals about 250 lb (113 kg). Its body shape also seems stout in relation to most of its relatives. Perhaps (though again, without certainty) sexual dimorphism is present in this species. The males are likely slightly smaller and lighter than the females. Also unique among dolphins, the length of the dorsal fin varies greatly between individuals. The rather amazing Hourglass Dolphin appears to possess a primarily circumpolar distribution. The farthest north its has ever been reliably sighted is the southern Atlantic Ocean. Further, most of the sightings occurred in the vicinity of New Zealand. In the majority of sightings, specimens have been traveling in groups of 5-10 individuals. The Hourglass Dolphin is also a carnivore by nature and its primary diet appears to be a variety of small fish, squid, and crustaceans. Its natural predators remain unknown, though the Orca is the most likely candidate for this. To date, the breeding patterns of this animal and lifespan remain a mystery. Placing third on our list of 10 Remarkable Rare Cetaceans is the well-known and visually rather unique Beluga Whale. This mammal, also popular as white whale and Delphinapterus leucas, is an extremely distinctive whale, and an Arctic and sub-Arctic cetacean. Next on our list of 10 Remarkable Rare Cetaceans is the extraordinary, and disappearing animal known as the Yangtze River Dolphin. Firstly, on most lists, this truly remarkable creature ranks now as the rarest known creature in the world, with the recent extinction of the Pinta Island Tortoise. In fact, most experts, including the IUCN, also consider it to now be functionally extinct. This means that its numbers have shrunk below the level of its ability to sustain a stable population. Once rather numerous in the Yangtze River, its numbers dwindled rapidly as China industrialized the river. Most notably, these uses included transportation, commercial fishing, and hydroelectricity, all of which greatly disturbed its habitat. Firstly, in coloring, the lovely Yangtze River Dolphin generally displays a blue-grey, with the exception of the stomach. This also most commonly presents an off-white color. The dolphin also displays a small degree of sexual dimorphism, with females growing slightly larger than the males. In addition, females typically reach a little more than 8 ft (2.5 m) in length, while the males attain a length of roughly 7.5 ft (2.e m). Yet both genders average around 500 lb (220 kg) in weight. While never successfully bred in captivity, experts estimate its average lifespan in the wild to be 24 years. Historically, the Yangtze River Dolphin, also known as the Baiji, primarily inhabited the lower half of the Yangtze River, in Asia, hence one of its common names. However, its habitat range also included Dongting Lake, Poyang Lake, and the much smaller Qiantang River. Since sightings also occur rarely, experts know little of its preferred habitat, except that sightings usually occur far from shore. While occasional possible sightings still occur, the last confirmed sighting of this species happened in 2007. Next on our list of 10 Remarkable Rare Cetaceans comes the astounding, and in some ways legendary, Narwhal. Firstly, the rather remarkable mammal, Monodon monoceros, sometimes called the narwhale, ranks as a medium-sized toothed whale and the animal with the largest canines on the planet. The mammal also grows to be a medium-sized whale, or around the same size as related species. Total length in both sexes, excluding the tusk of the male, can range from 13-18 ft. (4-5.5 m). In addition, typical adult body weight measures between 1,800-3,500 lbs (800-1,600 kg). Males attain sexual maturity at 11 to 13 years of age, when they reach roughly 13 ft (4 m) in length, while females do so at 5 to 8 years old when they reach about 11 ft (3.3 m) long. Most notably, the pigmentation of the Narwhal develops as a mottled pattern, with blackish-brown markings over a white background, unlike any other species of whale in any ocean. The coloring of the creature also appears darkest at birth, becoming whiter in color with age. White patches develop on the navel and genital slit at sexual maturity. Old males may also be almost pure white. 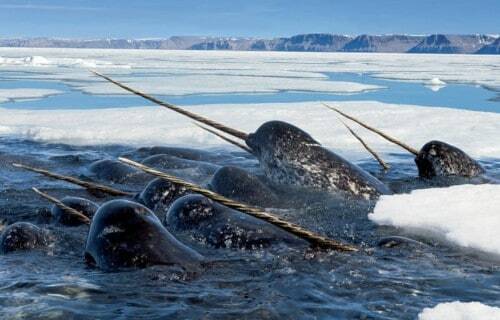 Narwhals do not have a dorsal fin – possibly an evolutionary adaptation to swimming easily under ice. In addition, the neck vertebrae do not fuse together but stay jointed, like those of land mammals. Both these characteristics are shared by the beluga whale, a fellow inhabitant of icy Arctic seas. While the tail flukes of female narwhals have front edges that sweep back, those of males have front edges that are more concave and lack a sweepback. This is an adaptation for reducing drag caused by the tusk. Firstly, the most conspicuous characteristic of the male narwhal remains its single extremely long tusk. Further, this actually represents a canine tooth that projects from the left side of the upper jaw, through the lip and forms a left-handed helix. The tusk also grows throughout life reaching lengths of as much as 10 ft (3.1 m). Despite its rather formidable appearance, the tusk is hollow and weighs only about 22 lbs (10 kg). About one in 500 males has two tusks, which occurs when the right canine, normally small and less straight, also grows out through the lip. Females may grow tusks sometimes, although the evidence on the frequency of this is somewhat conflicting. The tusks are surrounded posteriorly, ventrally, and laterally by several small teeth which vary in morphology and histology. These teeth are vestigial and never erupt from the lip, as such the Narwhal’s mouth appears toothless. The animal inhabits predominantly the Atlantic and Russian areas of the Arctic Ocean. Individuals also commonly appear in the northern part of Hudson Bay, Hudson Strait, and the Baffin Bay – off the east coast of Greenland. The Narwhal often visits a strip running east from the northern end of Greenland round to eastern Russia. Additionally, the northernmost sightings of narwhal have occurred north of Franz Joseph Land. Also, most of the world’s narwhals inhabit the fjords and inlets of Northern Canada and western Greenland. Individuals remain able to survive diving to rather incredible depths of up to 4,900 ft (1,500 m) below sea level. The Narwhal also has a relatively restricted and specialized diet. Its prey predominantly includes halibut, cod, shrimp, cuttlefish, and arm hook squid. Additional items found in its stomach have included capelin, wolffish, and sometimes rocks, accidentally ingested when whales feed near the bottom. Due to the lack of well-developed dentition in the mouth, Narwhals most likely feed by swimming towards prey until it is within close range and then sucking it with considerable force into the mouth. The next entry on our list of 10 Remarkable Rare Cetaceans is the amazing and unforgettable Irrawaddy Dolphin. This truly fabulous, and also highly distinctive looking, cetacean has an extremely disjointed population concentration. Sir Richard Owen first identified this fascinating mammal in 1866, yet it was believed to be a member of another species. Due to an extreme similarity in physical appearance, the two species were not recognized as separate and distinct until 2005. Because of its scattered population, scant numbers, and interactions with humans, the IUCN currently lists it as Endangered. Unlike many mammals, the truly remarkable Irrawaddy Dolphin displays no noticeable signs of sexual dimorphism. Furthermore, being relatively small for a dolphin, this amazing creature only attains an average length of about 7.5 ft (2.3 m). In addition, its overall coloring consists of dark gray to dark blue above, and significantly paler on the underside, with no precise pattern. Also, its flippers grow long and broad compared to related species, while its large head and melon display a decidedly non-prominent beak. Finally, it has the distinction of being the only known variety of dolphin to possess a blowhole to the left of the midline, opening towards the head. Above all, the extremely distinctive Irrawaddy Dolphin has an unusual distribution, given that it inhabits both salt water and fresh water. This magnificent animal is also distributed in a broken pattern across the coastal Indian Ocean from India to Indonesia, in Asia. Technically, it represents a sea-dwelling species, but many individuals also inhabit freshwater regions, such as bays, estuaries, and even rivers. Also, much like related species, it feeds on a wide variety of local species, including small crustaceans, cephalopods, and fish. Although it typically travels in small groups of 2-3 individuals, occasionally larger groups of up to 25 will group together to hunt. Certainly not to be overlooked, the seventh entry on our list of 10 Remarkable Rare Cetaceans is the impressive Spade Toothed Whale. Firstly, this amazing whale remains the rarest and least known large mammal on earth. No records of sightings of this animal exist. Secondly, all photos in this article will, therefore, be of physically similar creatures, just to provide an idea of its appearance. Its numbers also remain entirely unknown, but of course, it appears to be extremely rare. The IUCN currently has no ranking for the creature. The Spade Toothed Whale does, however, enjoy the listing of Protected Species. To date, our only knowledge of these creatures also comes from two fully intact Spade Toothed Whale cadavers. These consisted of a female and her calf. Furthermore, the female measured roughly 17.4 ft (5.3 m) in length, and the calf about 11.5 ft (3.5 m). Further, the name of the mammal comes from the physical characteristic that most distinguishes them from similar cetaceans. The teeth of the Spade Toothed Whale grow rather large for a whale of its size. These teeth also measure roughly 9 in (23.5 cm) long and their shape bears a resemblance to a type of spade once used by whalers. In color, the species appears to be various shades of black, gray, and white. What little we know of the Spade Toothed Whale comes from the examination of a few carcasses that happened to wash ashore. Consequently, we also know nothing about its behavior. Researchers further assume the creature to possess patterns similar to other deep-dwelling cetaceans. This implies it likely lives either alone or in small groups. Its diet most probably consists of a variety of small fish and cephalopods. Next on our list of 10 Remarkable Rare Cetaceans, in all its splendor, comes the astounding Araguaian River Dolphin. This truly remarkable variety of mammal represents a newly discovered species of river dolphin. It became the first newly recognized variety in nearly 100 years. This truly fascinating species of mammal only received recognition as a separate species from the Amazon River Dolphin in 2014. This also made it the first new species of river dolphin recognized since 1918. Like all known species of river dolphin, many individuals consider this beautiful creature highly threatened. However, it does not yet have an official classification with the IUCN. Unfortunately, destruction of its native habitat continues at a rather prodigious rate. Perhaps the most distinctive feature of the Araguaian River Dolphin is its rather distinctive coloring. The color varies between individuals, yet it primarily ranges from gray to bright pink. The body length may be as great as 8.5 ft (2.6 m). The neck vertebrae of this dolphin remain uniquely un-fused. As a result, individuals possess the ability to turn their heads to extreme angles. The eyes develop smaller than any other species of river dolphin yet the snout grows longer. As a result of having such small eyes, its vision remains rather poor. Like all known related species, this amazing creature also uses echolocation to hunt for its prey. The rather remarkable Araguaian River Dolphin appears to be endemic to a restricted region of Brazil, in South America. The creature has also, so far been found only within the Araguaia-Tocantins basin. In addition, estimates of the number of remaining individuals vary greatly, yet ranges between 600-1,500. This also implies an extremely limited genetic diversity. The creature, like other related species, also preys on a wide variety of small fish species that share its highly limited habitat range. The ecology of its habitat has been negatively affected by agricultural, ranching and industrial activities, and also by the use of dams for hydroelectric power. The ninth animal on our list of 10 Remarkable Rare Cetaceans is the little-known mammal called the False Killer Whale. Despite the common name, as a member of the Blackfish group, the remarkable cetacean isn’t even a whale at all. This impressive ocean species actually represents one of the largest members of the dolphin family. This species exhibits the same spirit of playfulness that the smaller and better-known dolphin species do. As a result of this behavior, it remains the only member of its group to ride bow waves on a regular basis. However, due to its depredation of fishing lines, it continues to be routinely hunted in parts of its endemic range. Additionally, this predominantly occurs in Japan, where it, unfortunately, remains the target of organized hunting drives. Due to such activities, in addition to other dangers, it now faces grave concerns for its future. While the IUCN does include it on the Red List of Threatened Species, its current status remains Data Deficient. Firstly, the False Killer Whale, like many related species displays sexual dimorphism, though the difference remains very slight in its case. Due to this, individuals of both genders of this particular species typically attain an average body length of about 16.1 ft (4.9 m). However, exceptional males do tend to attain a greater length and weight, with males measuring a maximum of 4,900 lb (2,200 kg). On the other hand, exceptional female individuals may attain a maximum known weight of about 2,600 lb (1,200 kg). In addition, the coloring typically consists of a pattern of dark gray or black on the upper side and a slightly lighter coloring underneath. The magnificent False Killer Whale has a broad, yet specific distribution. While it inhabits three separate oceans, it primarily occurs only in the temperate or tropical regions. Individuals often appear on the surface, but it typically inhabits regions with a depth greater than 3,300 ft (1,000 m). Like all dolphins, it evolved as a carnivore and primarily feeds on fish and cephalopods. Yet small marine mammals will occasionally be taken as well. It has a highly social nature and typically inhabits pods of between 10-60 individuals. It also often temporarily joins with pods of other dolphin species, sometimes forming groups of hundreds. This species reaches maturity at about 12 years of age and has an average lifespan of about 60 years. Sadly, for reasons that remain a mystery, it also ranks among the most common cetaceans to engage in mass strandings. Placing last on our list of 10 Remarkable Rare Cetaceans only through random chance comes the extraordinary Vaquita. The remarkable Vaquita represents a rather unique member of the family containing porpoises. In addition, in terms of size, it remains the smallest of all ocean-dwelling forms of cetacean. Sadly, it also currently ranks as the most highly endangered type of cetacean known to man. Also, as of March 2018, the known population of the entire species consisted of only 12-15 individuals. The IUCN has, rather understandably, also listed the beautiful ocean mammal as Critically Endangered. In addition to other distinctions, the breathtaking Vaquita also measures out as the smallest of all known cetaceans. It also displays a slight degree of sexual dimorphism. In the case of this animal, the female grows slightly larger than the male. Females attain an average length of 55.4 in (140.6 cm). However, the smaller males only average a length of 53.1 in (135 cm). Its shape also remains rather stocky, and presents a dark gray color on the back, along with a whitish underside. It can also be easily distinguished by the presence of dark rings circling the eyes, as well as a line from the dorsal fin to the eyes. Sadly, the entire habitat range of the beautiful Vaquita only consists of the northern part of the bay of California, in Mexico, in North America. Further, within that highly restricted range, individuals typically inhabit dark, shallow lagoons along the shoreline. In addition, the animal rarely ventures into areas more than 160 ft (50 m) deep, and usually far less than that. The species also generally forages in lagoons, feeding on a variety of small fish, crustaceans, squid, and octopuses. Researchers know little of its life cycle, but estimate a life span of about 20 years, under ideal conditions. We certainly hope that you have enjoyed our list of 10 Remarkable Rare Cetaceans. These represent just a small handful of the amazing creatures in our world. Each of these 10 is in danger of extinction, but so are countless others, as well. It remains up to us to do something to prevent that, or future generations will not be able to enjoy their beauty. Let us all take every step that we can to ensure their survival.